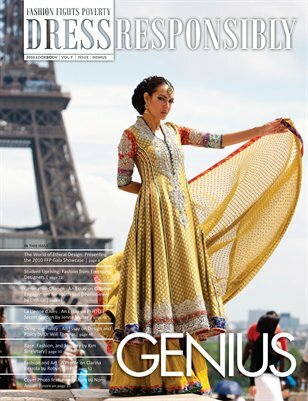 The “Genius” Issue tackles the role of fashion and creativity in larger social and political contexts. “Generation Change” by Linh Le discusses the role the arts play in empowering youth around the world; “La Lienne d’Alès” by Jenna Muller describes the history of PHYTO; “Designing Policy” by Dr. Will Thomas applies good design to policy making; “Race, Fashion, and Identity” by Kim Singletary discusses the issue of race in fashion; and Robyn Russo profiles Swiss performance artist Clarina Bezolla, who works with fashion as art. We also profile Nomi Ansari, Chez Kevito, and Crooked Monkey. “Student Uprising,” is a fashion editorial photographed in Dallas by Sara Kerens, in New York by Giselle Behrens, and in Washington DC by Danny Kim featuring the work of student designers Jonathan Aparicio, Alana Leuterio, Marissa Morales, Adam Paik, Kim Troung, and Michael Van Maele. We conclude with an interview by Ryan Charchian with Alexis Foreman, a 16 year-old member of Seventeen Magazine’s Style Council.